Salmon is one of my favourite fishes. It tastes great, it’s zero SmartPoints and it is packed full of protein and omega-3 fatty acids. They are good for you, those omega-3 fatty acids! So I’m told. 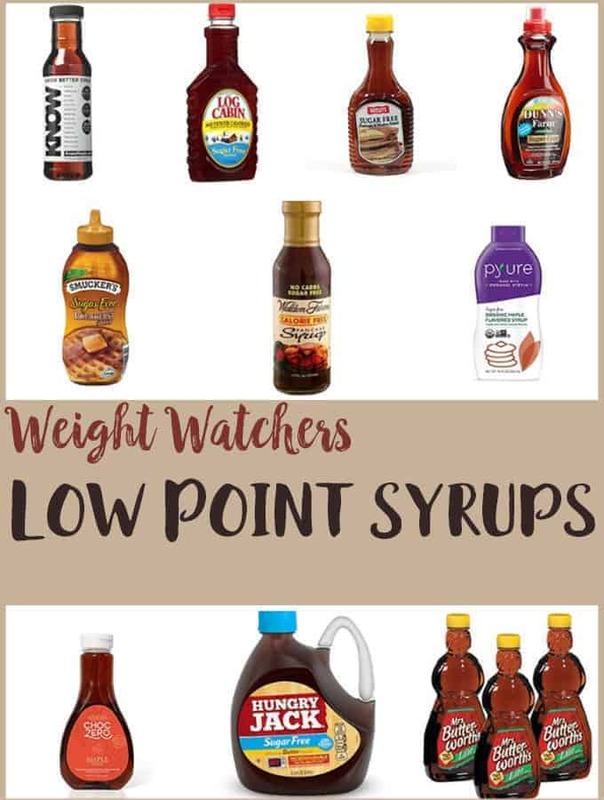 They are a healthy oil which are said to help with anti inflammatory effects in the body. Great for those achy winter joints! If you are looking for salmon recipes, you may also like to give this zero SmartPoint Salmon, Pea & Horseradish Frittata a go. 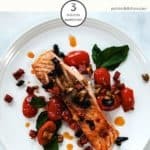 You can use fresh or frozen salmon for this Chorizo Salmon recipe. If you use frozen salmon fillets, defrost them thoroughly in the fridge. This can take some time, so be prepared to take them out the freezer a good 6 – 10 hours before you are planning to cook them. Obviously the time it takes for them to defrost is very dependant on the size of the fillet. Alternatively, you can defrost Salmon fillets with cold water. Place the fillets in a plastic bag and secure the bag so that no water can seep in. Place the bag in a bowl or sink and cover with cold water (not hot). Every 10 minutes or so drain the water off and cover with more cold water. Do this 3 – 4 times until the fish has defrosted. 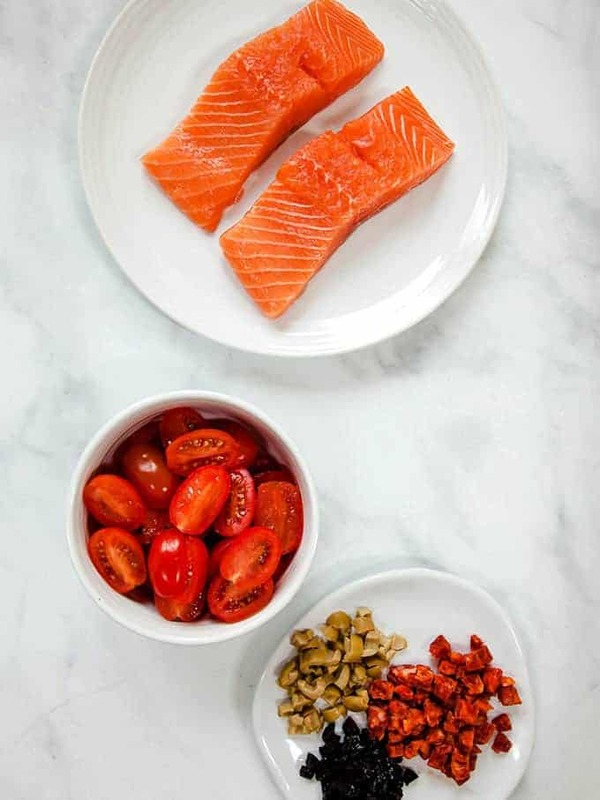 Cook the salmon as soon as it has defrosted. Don’t be tempted to put salmon fillets in the microwave to defrost. It will ruin them! I used skinless salmon. If you use salmon fillets with the skin still on, place the fillet in the pan flesh side down before turning it over to cook the skin side. This way the skin will crisp up nicely. I used a spicy Spanish chorizo. The brand I used could be eaten raw but was also suitable for cooking. Look for one with a bit of a ‘kick’ if you like a bit of spice. I am totally in love with my new Le Creuset non stick frying pan! I’ve been through a number of non stick pans, but this one is by far my favourite. You can purchase Le Creuset skillets / frying pan in lots of sizes from good kitchen shops or here from Amazon. I used a mixture of black and green olives, but use whatever olives you have handy. I eat this Chorizo Salmon on its own if I am having it at lunchtime. 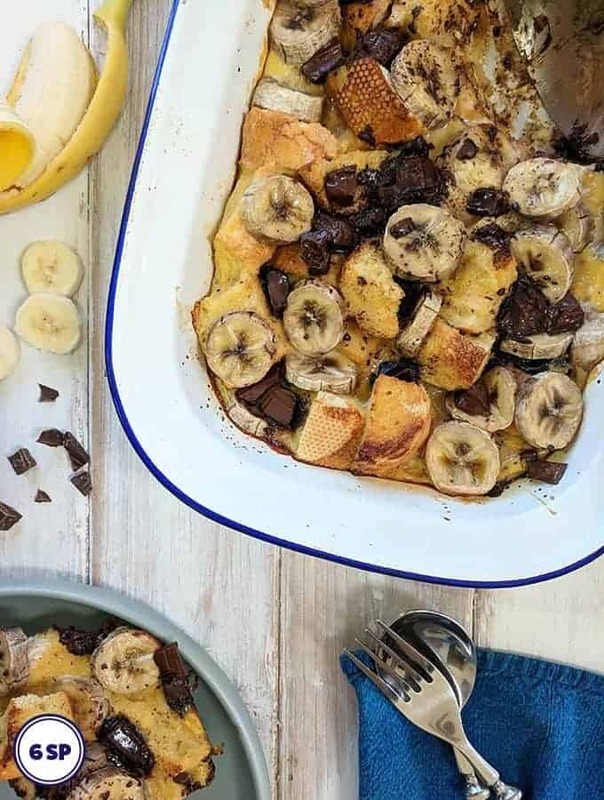 You may like to serve it with a small portion of new potatoes (for an extra 3 SmartPoints) if you are eating it for your main meal. 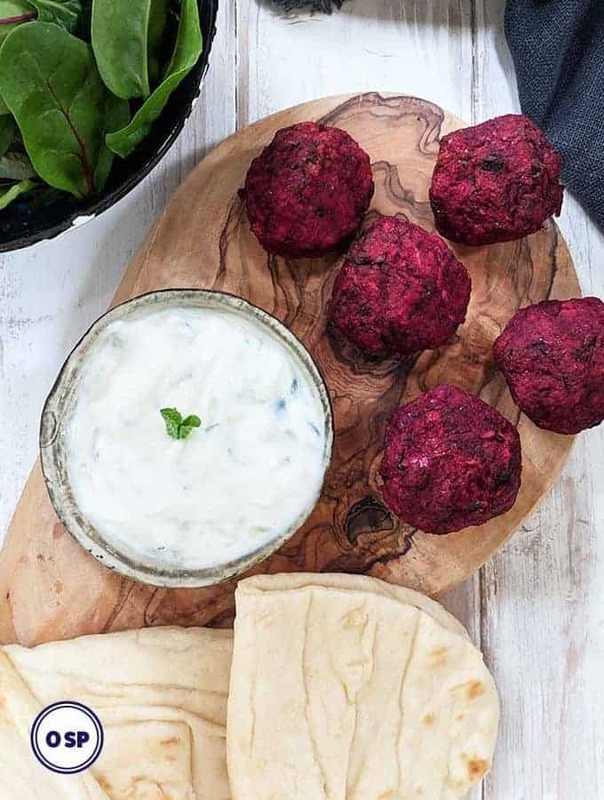 Serve it on top of a bowl of crisp lettuce leaves. Use the spicy, smokey oil from the chorizo to drizzle over the lettuce leaves as a spicy dressing! 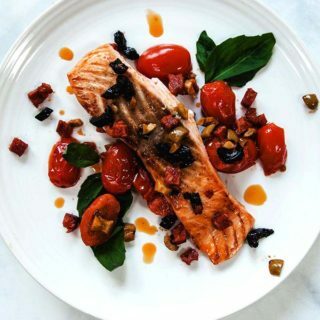 This tasty Chorizo Salmon takes less than 15 minutes to make & is just 3 SmartPoints per portion on Weight Watchers Freestyle plan. Place the salmon in a non stick frying pan / skillet over a medium heat. There is no need for oil if you have a good quality non stick pan. Cook for 2 - 3 minutes until the salmon starts to sizzle then carefully turn it over. 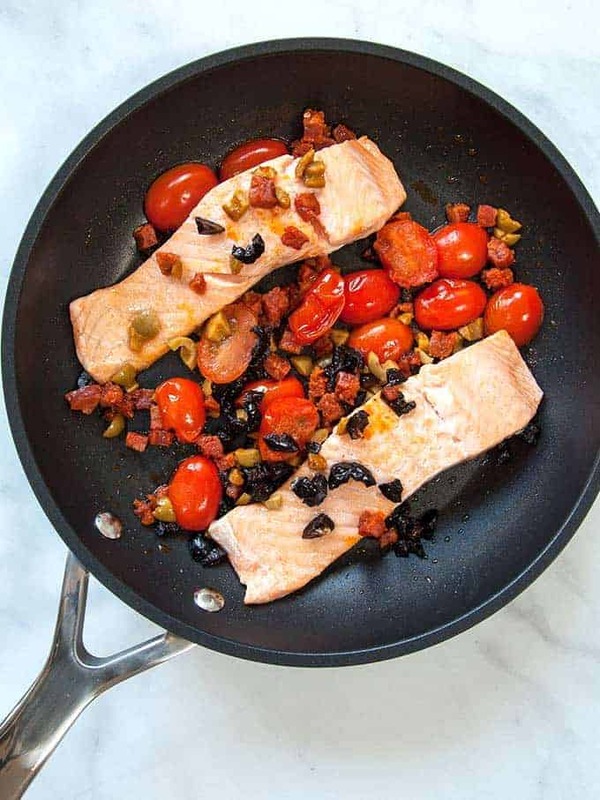 Add the chopped tomatoes, chorizo and olives and cook for a further 5 minutes or until the salmon is cooked through and the chorizo releases its oil and turns crispy. 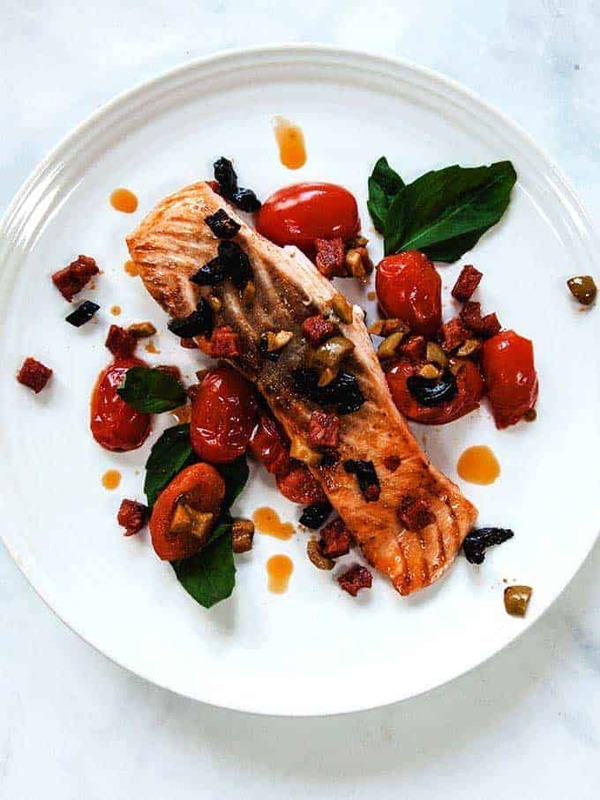 Plate the salmon and spoon over the chorizo, olives and tomatoes. Drizzle with any oil left in the pan and garnish with torn basil leaves.